Warming up before the morning session begins. In the first exercise, we study holding your partner using your arms around their chest, shoulders, neck or the under the arm and over the shoulder or various combinations. It’s a duet. The response of the held person can be to avoid their arms encircling you – going to the side – or to confound the hold by drawing-in (space filling) for example. When I try this with a partner then afterwards I say that it’s really like a giving a hug. They’re not impressed! The intention of the attacker/leader is to put their hands around the neck of the defending or receiving person. The response of the defender is to use their hands to deflect the advancing hands and thus prevent them from reaching the neck. We also try a variant where the advancing hands are much closer to the neck and where using the forearms and elbows allows deflection or simply pushing the hands away. Bruno also describes a situation where a martial arts teacher was being strangled ie hands are around the neck. The teacher’s response was to use his free hands and slap the palms onto the ears of the attacker – hard. The attacker had to be taken to hospital. We don’t try this! We work in trios using the holds which we have learned in our partner exercise above (duets). One of us is the defender and the others the attackers. After swapping the roles then we try the exercise and dissolve the roles of attackers and defender. We are changing between attacking and defending without a discussion in a fluid way. It’s a non-verbal dialogue – of a sort. Sketch: Hold and release movement. The defender holds the attacker from behind with their arms wrapped around them. One question which Bruno puts to us is how to escape a hold where you are standing and the attacker has their arms around your trunk/ waist? He shows a manoeuvre where the standing partner/defender performs a downward movement of their centre while projecting their belly out. 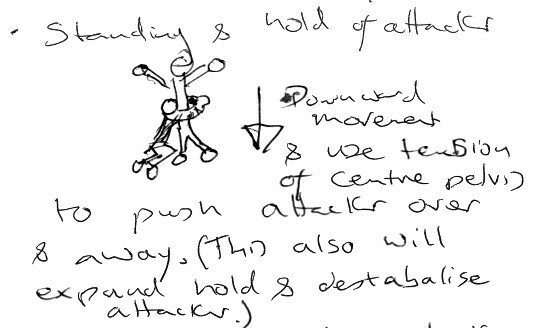 It expands the hold and pushes the attacker out and away. Since the attacker is in an unstable stance then they fall. We try it with a partner. Another variant is demonstrated where the arms of the standing partner are within the old too. The trick is to keep the arms like rails rather than trying to flex them and push the attacker away. After lunch we review the learning so far, and then further study movement with the fighting sticks introduced the previous day. The stick is moved slowly in a swinging motion either horizontally (slicing), vertically (chopping) or in a poking/stabbing motion. We refine our movement keeping stability, looking toward the movement, going to the floor as needed. Keeping control. The defender can move to the side – avoiding the path of the stick but also towards the body of the attacker. The idea being that, as their hands are on the stick then their movement potential is compromised. They are holding the stick but the stick holds them too. Once the defender can enter the space of the attacker then they intercept them with a hold or fall them. One interesting aspect of the stick is that it is an intermediate between the two dancers who we call ‘attacker and defender’. Visually, the stick is a line in motion. The stick can also be used as a vehicle for movement – allowing spiralling or rotation about an axis in a dancer. Pole dancing uses a ‘vertical stick’ after-all albeit one which can also support weight. The stick could also be akin to a baton too. We don’t explore these ideas. We are told to maintain our axis when defending and to ground ourselves and us our centre in a warrior like pose (but not like the yoga one!). We assemble into a circle sat on the floor. In the centre of the circle, there are six couples who are using the fighting sticks in duets. 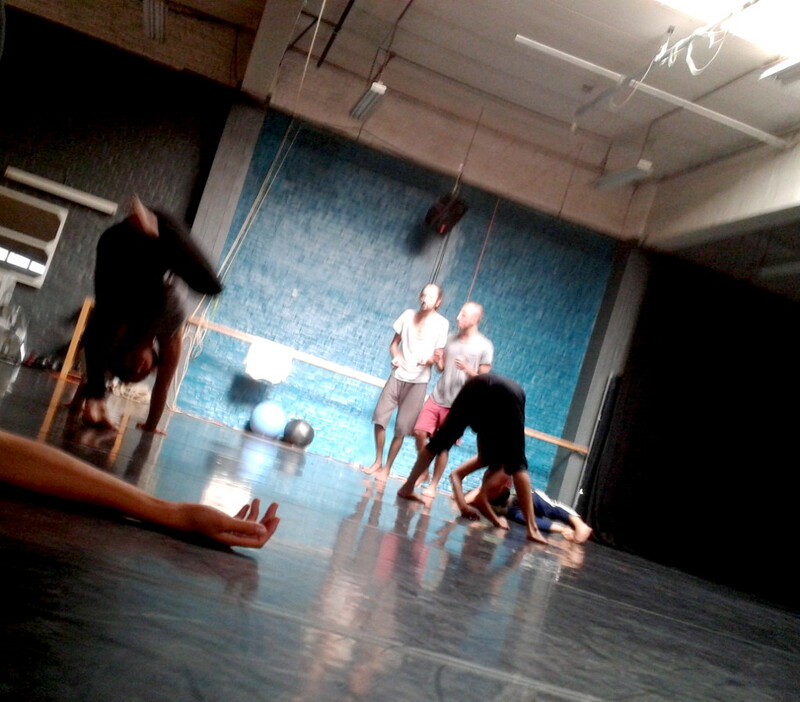 After a while, we change the performers and audience so that we’re all danced. I dance with someone who is experienced in play-fighting. They advise me to move slower as I am confounding the movement practice. In the evening, we have a jam and a few people from outside the course join us. 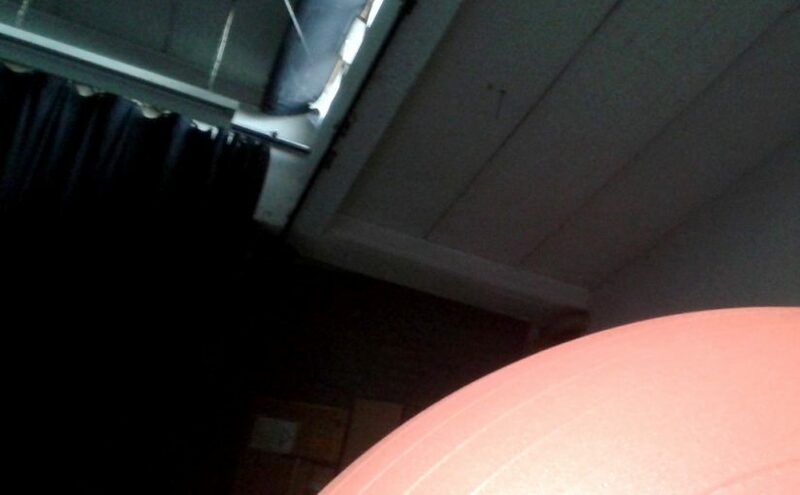 Top/featured image: Looking to the ceiling of Hybrid Studios with a physio ball in the foreground.